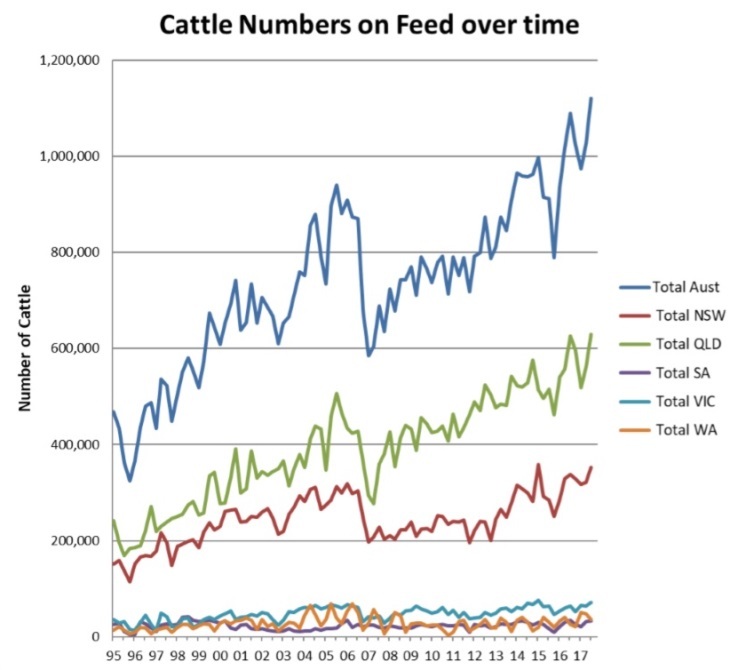 CATTLE numbers on feed across Australia rocketed to a new record high of 1.12 million head in the June quarter, driven by continental-scale drought across large parts of Eastern Australia. The number was up almost 95,000 head or nine percent on the March quarter, according to results in the latest quarterly industry survey conducted by the Australian Lot Feeders Association and Meat & Livestock Australia. Greater feeding activity was seen across most feedlot size categories, with small opportunity-type yards 500-1000 head in size rising 30pc, and the largest +10,000 head capacity yards up 7pc. Queensland showed the largest outright and percentage increase in numbers, rising by 67,962 head or 12pc to almost 629,500 head since the March quarter. It was only the second time in history that Queensland numbers have exceeded 600,000 head. New South Wales was not far behind in percentage terms, up 10pc or 30,924 head to almost 351,000 head. Victorian yards also lifted by 10pc or 6643 head on the previous quarter, to almost 71,000 head on feed. The only state to show a decrease in activity over the quarter was Western Australia, which declined 25pc to 35,285 head between March and June. ALFA president Tess Herbert said the unprecedented numbers of cattle on feed was due to the deteriorating seasonal conditions and continued demand for quality Australian beef. “Feedlots play a critical role in meeting consumer led demand for product quality, consistency and availability, no matter the seasonal conditions, however expanding drought conditions over the quarter has certainly contributed to feedlot cattle inventory reaching record levels,” Mrs Herbert said. “All supply chain participants are being challenged under these conditions, and with feedlots at 86 percent utilisation, even in the face of tightening commodity market conditions, it’s a reflection of good contingency planning and just how sophisticated and resilient lotfeeding businesses have become,” she said. Investor confidence in the feedlot production system continues to be reflected in the sector’s growing capacity figures, which increased again during the June quarter to 1.301 million head. MLA’s manager of market intelligence, Scott Tolmie, said that poor prospects for the winter cropping season elevated demand for grain and drove prices higher throughout the quarter, putting pressure on lotfeeders. “Steady gains in grain prices were experienced with wheat ex-Darling Downs, averaging $381/tonne during the June quarter, and barley averaging $383/t – up 16pc and 17pc on the March quarter,” Mr Tolmie said. That represented a respective increase of 48pc and 58pc year-on-year in wheat and barley price, he said. Over the hooks indicators remained relatively stable during the quarter, due to robust Asian demand with grainfed beef exports up 10pc from the same period last year, reaching a new quarterly high of 74,932t shipped weight, Mr Tolmie said. Strong export demand was experienced across traditional grainfed markets with shipments to Japan and Korea both up 8pc year-on-year. Volumes to China lifted 74pc from year-ago levels to 12,653t, which for the June quarter saw China overtake South Korea to become Australia’s second largest grainfed beef market by volume.